Day 39 with the Doctor of the Day, Dr. Dwayne Watkins. On Thursday, March 30, the House and Senate completed legislative day 40, the final day of the 2017 legislative session, also known as “sine die.” Sine die is a Latin term meaning “without assigning a day for further meeting.” As we convened this week for the final two days of the legislative session, we worked late into the night both days to ensure that important legislation for our state had every opportunity to be considered this year, and we passed many quality pieces of legislation that will now go to Governor Deal’s desk for consideration. The House passed Senate Bill 88 this week in an effort to combat our state’s devastating opioid epidemic. SB 88, the Narcotic Treatment Programs Enforcement Act, would update the application process and licensing requirements for Georgia’s drug abuse treatment and education programs and narcotic treatment facilities that treat individuals who are dependent on heroin and opiate-like drugs. This act would apply to any system of treatment that administers narcotic drugs under physicians’ orders either for detoxification purposes or maintenance treatment of an individual who is drug-dependent. SB 88 would establish minimum quality standards, regulation and oversight for narcotic treatment programs in Georgia under the Department of Community Health (DCH). DCH would enforce minimum operating standards, including necessities such as adequate buildings or housing facilities and program equipment, sufficiently trained staff, intake and discharge of drug dependent persons and coordination with other programs and agencies in the state to allow for continuity of care after discharge. SB 88 would require those interested in opening a narcotic treatment to apply to DCH during an annual or biannual enrollment period and attend a mandatory information forum prior to the open enrollment period. After the open enrollment period, applicants would be considered by an application review process committee and would be required to prove that communities need their services by providing data and details on treatment and counseling plans, qualifications of owners and all required staff, existing narcotic treatment programs and those programs’ patients within a 75-mile radius of the proposed location and the community surrounding the proposed location. SB 88 would establish 49 regions with the number of narcotic treatment programs in each region limited to four in order to evenly distribute access to care across the state. DCH would have the authority to deny applicants and suspend or revoke licenses if rules or regulations are violated. This legislation builds upon SB 402, legislation that passed during the 2016 session, which placed a moratorium on new applications for the licensure of narcotic treatment programs and created the State Commission on Narcotic Treatment Programs to study the necessary changes to program licensure laws during the moratorium. Georgia has 67 narcotic treatment center programs, and compared to the 65 centers in Florida and 12 in Tennessee, Georgia has been disproportionately over-served by these facilities. This much needed legislation would address this issue while providing life-saving programs and solutions to the opioid and heroin epidemic in Georgia. Well-equipped and financially stable hospitals are essential in ensuring the health and well-being of all Georgians, yet many of Georgia’s rural hospitals face dire financial situations which have forced several of these indispensable health care facilities to close. Georgia has seen five rural hospitals close in this state since 2013, with many more facing financial hardships, and this legislation would encourage donations and incentivize medical professionals to work in our rural hospitals to ensure that Georgians in all parts of our great state have access to the medical care they need. Senate Bill 180 passed the House unanimously this week and would modify the Rural Hospital Tax Credit legislation, which was passed last session, to incentivize and attract individual and corporate donations to rural hospitals in areas with a population of 50,000 persons or less. SB 180 would increase the amount of the tax credit for contributions to rural hospital from 70 percent of the actual amount expended to 90 percent of the donation or $5,000 per year for individuals, and from 70 of the amount expended to 90 percent of the donation or $10,000 per year for married couples. Corporations would be able to receive a tax credit worth up to 90 percent of their donation or up to 75 percent of the corporation’s income tax liability, whichever is less, and would cap the tax credit at $60 million for 2017, 2018 and 2019. This bill would propose a solution to the critical shortage of health care professionals in rural areas by providing a tax credit for physicians, advanced practice registered nurses and physician’s assistants who serve as volunteer mentors who help train medical, physician’s assistant and advanced practice registered nurse students. The House passed yet another important measure this week to assist Georgia’s struggling rural hospitals and the citizens they serve. Senate Bill 14, the Rural Hospital Organization Assistance Act of 2017, would offer a solution to offset the financial burdens plaguing rural hospitals by allowing rural hospital organizations to apply for state grants. Under SB 14, the Department of Community Health would be responsible for distributing the grants to rural hospital organizations, and the grants would be capped at $4 million per grant per calendar year. These grants would only be awarded to hospitals that continue to deliver essential health care services to their communities and engage in long-term planning and restructuring programs to meet local health care needs. Grants would be awarded for infrastructure development, strategic planning, nontraditional health care delivery systems and the establishment of 24-hour emergency room services open to the public. Our rural hospital organizations are essential in promoting public health and preserving the availability of primary health care services for all Georgians, and SB 14 would ensure our rural hospitals are financially secure enough to remain open and able to continue providing essential services to Georgian’s in every corner of our state. Senate Bill 250 unanimously passed the House this week. This bill would provide greater protections for our state’s most vulnerable population. SB 250 would prohibit individuals who are registered on another state’s sexual offender registry or have been convicted and failed to register from residing, working or loitering near any child care facility, school, church or any other area where minors gather. Current law prohibits registered sexual offenders in Georgia from residing, working or loitering in such areas, but does not extend its coverage to include those individuals who are registered in other states. SB 250 would close the loophole in existing law and ensure that no person on any state’s sexual offender registry would be permitted near our state’s youngest and most precious citizens. Now that this year’s legislative session has come to an end, the governor will begin reviewing the legislation that received final passage by the House and Senate, and these measures will become state laws upon Governor Deal’s signature. If the governor does not sign or veto a measure within 40 days, it automatically becomes law. While the 2017 legislative session has adjourned sine die, I remain dedicated to serving your interests as your state representative, and I hope that you will contact me with any questions or concerns you may have regarding the 2017 legislative session or with any proposals or recommendations for future legislation. 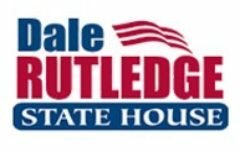 You can reach me at my capitol office at 404.656.0254 and my email address is dale.rutledge@house.ga.gov. Also, because the House has adjourned for the year, I will be spending much more time in our district. Feel free to contact me locally at 404.267.0735. Thank you for allowing me to serve as your representative. Author Dale RutledgePosted on April 4, 2017 Categories Why me?